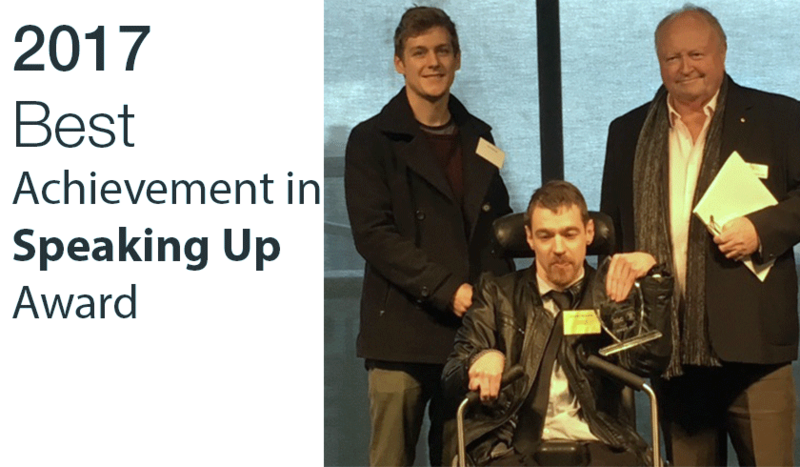 The Disability Services Commissioner, Laurie Harkin AM, was pleased to present the 2017 Best Achievement in Speaking Up Award at the Funds in Court Inspire Awards to Brendan McCarthy. Brendan has made a significant contribution to the community by speaking up for the needs of people with severe and profound disabilities. Brendan has played an important role in raising awareness for the need for accessible changing facilities for people with physical disabilities at community venues. As part of the Changing Places advocacy project, Brendan has advocated for local councils, developers and facility managers to develop toilet and change rooms facilities with full sized change rooms and hoists to meet the needs of people with disabilities. Brendan has been the campaign face and attended meetings for Changing Places since 2010 where he has lobbied to change building standards. Brendan has also been part of opening new accessible change room facilities at the MCG, St Kilda foreshore and recently at Melbourne Zoo. Brendan’s latest project is a campaign for Chadstone Shopping Centre to build a Changing Places facility. Having an accessible changing facility in the centre would allow him and many other people to increase their time socialising, going to the movies and shopping. Over time, Brendan’s confidence, self-esteem and his capacity to speak up about issues of importance to him has grown immensely. Brendan’s experiences and his enthusiasm to gain knowledge have empowered him to present to community and disability groups about the importance of the Changing Places program. He has presented to community groups such as Uniting Care, Interchange, VALID’s Self-Advocacy Network and VALID’s ‘Having a Say’ conference. Brendan has become a role model not only to others with cerebral palsy but to all members of the community. For more information about the Inspire Awards, visit: http://www.supremecourt.vic.gov.au/home/contact+us/news/funds+in+court+inspire+awards.